''Practising law, whether as a politician, a judge, a lawyer or an academic, is to a certain degree creating or influencing policy'', Walter Van Gerven once wrote. This statement and many other similar or opposite statements make one wonder about the nature of the policies concerned, the identities of the decision makers and the rationale underlying those policies. On these and related questions PhD researchers from different Belgian law schools debated at the ACCA-conference held at Ghent University in May 2014. This book holds the fruits of those debates. 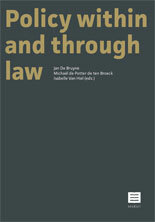 Hence, the book contains concise contributions focusing on policy questions in matters related to various fields of law, such as environmental, constitutional, civil, social, criminal, procedural or EU law. It seeks to provide an insight into the interplay between legislators and administrative bodies on the one hand and judges and legal scholars on the other hand, bringing about the creation of a new policy or the adjustment or abolishment of an existing policy.